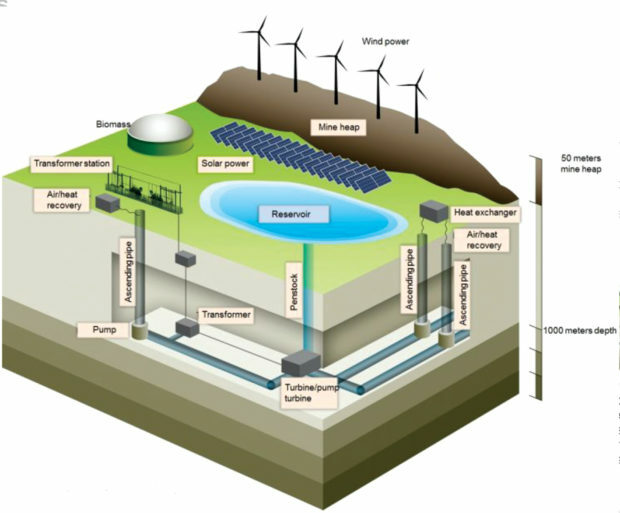 Pumped-storage (PWS) hydroelectricity systems are to be found throughout the world, but mainly on a large scale. The demand for storage associated with distributed renewable energy (RE) systems, particularly wind and solar power, has opened up the market for a new generation of PWS facilities can be built on a much smaller scale, while being economically viable and environmentally more acceptable than the larger plant. South Africa currently has two large PWS schemes: Drakensburg and Ingula. Both of these are in the gigawatt range, and two smaller, one owned by Eskom (Palmiet, which has a name plate capacity of 400 MW) and another (Steenbras, with a nameplate capacity of 180 MW) which is owned by the Cape Town Metro. The term PWS is usually associated with large plant involving tunnels and huge dams, and taking years to complete. The purpose of PWS up to now has been network storage, i.e. bulk storage of “surplus” energy on the grid to balance demands during peaks. The growth of renewable energy and the move to distributed generation, micro-grids and survival of sections of the grid have created a demand for smaller storage units, either to balance output or ensure security of supply. Table 1: Water volume requirements for various pressure head. Small PWS in the range of tens of MW or even several hundred MW, can be constructed above ground and using existing infrastructure. Items such as abandoned mines, quarries or even high rise buildings have been investigated as means to provide the necessary storage, and several projects are underway worldwide. Small PWS have been successfully combined with wind farms in island applications, but mainland sites are now being considered as well . In addition to network storage of hundreds of MW used to balance the entire wind production for an area, small PWS systems are being considered as supplementary storage to wind and solar farms ranging in size from 15 to 300 MW . The amount of storage required varies with the operating regime of the plant, but typically small PWS plants range from 10 to 300 MW in size with storage ranging from one to four hours at full capacity. There are many misconceptions about pumped storage and hydropower, and PWS is often proposed as a solution without consideration of the factors involved. It will be good to start with some of the basics. Two issues are important, namely potential energy and power. h = height (head) of water in m.
Using this formula we see that a m3 (1000 kg) of water with a head of 1000 m has the potential energy of 2725 kWh. Fig.1: Hydro plant performance curves (Sulzer). It should be fairly obvious that hydropower, especially PWS, requires both a large amount of water and a high head. To generate 1 MWh of energy with the above system would require 366 m3 of water, which is roughly equivalent to a reservoir with 100 m2 of surface area and a depth of 3,66 m.
Small PWS will not generally be associated with high heads of water, and it is clear that the volume of water required could be a limiting factor for small PWS systems. Where artificial upper reservoirs are anticipated, this could be a limiting factor. So the power generated by the PWS would depend on the flow rate and the head of water. 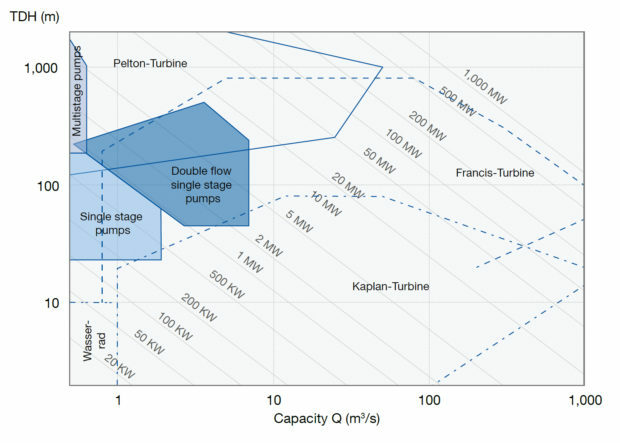 Fig.1 shows the relationship between flow rate, head and power generated by a hydro plant. For a river or dam based hydropower system the flow rate will be determined by the flow rate available from the feeding river. For a PWS system the flow rate will be determined by the required power generation capacity and the turbine type. Pipe sizes will be determined by the required flow rate. The flow rate will be limited by the head and the pipe size. This severely limits the use of some existing infrastructure, such a mine shafts, as the ground level dam would be considerable in size, and underground storage would consist of tunnels which may require sealing. Fig. 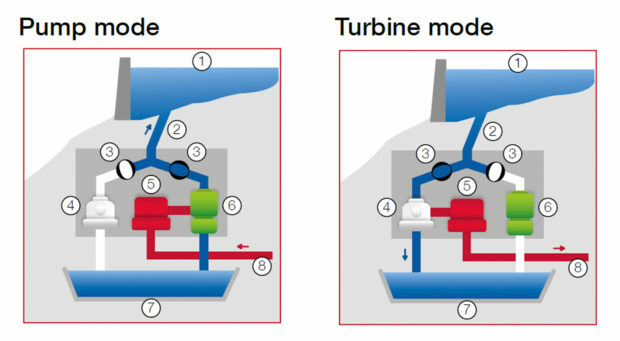 2: Combined pump-turbine configuration (Sulzer). Small PWS technology requirements are considerably simpler from the large reversible pump turbines used in large schemes, and in many cases, pump technology run in reverse can be used. One configuration uses two pumps in a dual configuration as shown in Fig. 2 . Such a configuration has the advantage that pumping rates and generation rates could differ, a factor which is not possible with fixed speed or even variable speed pump/turbines. The pumping rate could be adjusted to match the amount of spare energy available. With approximately 6000 abandoned mines across South Africa, this is an option which deserves consideration. Some have depths in excess of 500 m, and almost all have water accumulated in the underground workings. The use of abandoned mine shafts as PWS is suggested regularly in discussion on energy storage in SA, but no detailed study has been done to my knowledge. The biggest problem would be the mine head reservoir, as to store say 20 MWh with a mine depth of 500 m would require maybe 20 000 m3of water storage taking efficiency into account. In some cases the mine dump or slurry dam could be considered as an existing infrastructure to base the reservoir on but no detailed studies have been done. There are numerous studies and proposals in the literature on the use of abandoned mines for PWS systems and there are a few firm projects planning to use abandoned mines. Fig. 3: Kidston pumped hydro project site (Genex power). The Kidston project in Australia is a typical example of an open cast mine planned for re-use as PWS . As envisaged, the plan was to develop a 330 MW pumped hydro project on the old Kidston gold mine, involving water transfer between two pits at different altitudes. Queensland is a good place to develop such a project as peaking power is primarily provided by gas turbine generators. With substantial increases in gas prices expected, this makes the project financially interesting. There is a 20 Gℓ dam, which was built to service the mine, 18 km away. The Kidston project owns piping between the dam and the mine and it has water rights of 4,6 Gℓ annually should there be a drought. The basic plan was to connect two dams which are located at approximately 190 m vertically from each other. The initial plan involved three 110 MW reversible pumps, which will pump water from below to the top dam when there is excess power, or generate electricity via water from the top dam entering the lower dam. There is already a 132 kV transmission line providing connection to the North Queensland grid and this will be enhanced with a further 275 kV line. There is also a planned 50 MW solar PV farm, and this will be the highest quality solar resource in Australia, with strong community support. A binding agreement with Ergon Energy has been announced for power uptake. The planning for the solar PV farm in the old tailings area, can now proceed with the certainty that the power produced is sold into the grid and there is the possibility of extending this solar PV farm to 150MW. The project is expected to cost 20 to 25% of a traditional pumped storage system. There are similar plans to use abandoned open pit mines for combined solar/ PWS in other countries. There are several proposals in different countries to use underground mines as the basis for PWS. Among the more ingenious use the existing mine cavities for both the upper and lower reservoirs, thus obviating the need for new reservoirs above ground level. This makes it possible for the pumped storage project to be completely contained within the existing mine cavities. An example is the Prosper-Haniel coal mine in Germany (Fig. 5). The PWS is designed to generate about 200 MW with a storage capacity of 4 h. The upper reservoir is planned to hold 600 000 m3 of water, and the mine is about 600 m deep. The mining complex comprises 26 km of horizontal shafts, which would be used as the lower reservoir. The mine design has an added benefit from the air shafts, which will discharge hot air as the lower reservoir fills up, and heat will be recovered using heat exchangers. Fig. 4: Proposed PWS for abandoned coal mine (University of Duisburg-Essen). Small PWS are quite common alongside major rivers, but are limited in capacity, firstly by the head available and land available for the upper reservoir. A concept, developed by the Australian national university and based on small scale PWS is pairs of reservoirs, typically 10 ha each, are separated by an altitude difference of between 300 and 700 m, in hilly terrain or ex-mines and away from rivers, and joined by a pipe with a pump/turbine. Water circulates between the upper and lower reservoirs in a closed loop to store and generate power. Very little water is apparently required relative to conventional fossil fuel power stations. Estimated stations could be in size from 50 to 500 W and with a storage time of 4 to 20 h.
Problems with initial filling and compensation for evaporation and leakage. Such a network of small scale PWS is claimed to be able to provide sufficient storage capacity to allow operation from 100% renewable energy sources. 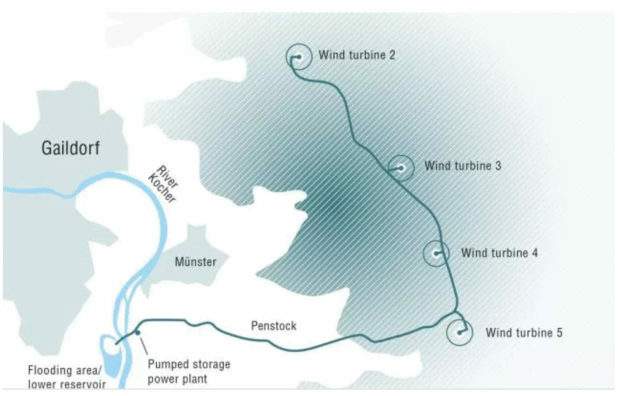 The concept of combining wind power with pumped hydropower has been taken to the extreme by GE in the Gaildorf project, located in Germany’s Swabian-Franconian forest on the Limburger Berge uplands . The project will comprise four of GE’s new 3,4 MW 137 turbines and a 16 MW pumped storage hydro-electric power plant supplied under a separate agreement Germany are storing water for hydroelectricity inside wind turbine towers allowing the towers act like massive batteries once the wind stops blowing. It’s the first major example of the two technologies being physically integrated to supply reliable renewable energy. The four-turbine project stores energy by pumping water about 35 m up inside the turbine structure itself. Basins around each base will store another 45 mℓ. When the wind stops, water flows downhill to generate hydroelectric power. A man-made lake in the valley below collects water until turbines pump the water back up again. The reservoirs are connected by a polyethylene penstock. The pumped storage powerhouse is a standardised, modular design. The base of each wind turbine is to be used as a water reservoir, increasing tower height by 40 m and extending tip height to a record-breaking 246,5 m. The lower reservoir for the pumped storage plant lies in a nearby valley, 200 m below the wind turbines. The combined wind and hydro power plant will be able to provide balancing power for fast-response stabilisation of the grid, according to GE. This would be an additional source of earnings on top of normal participation in the wholesale electricity market. During times of peak demand and high electricity prices, the hydro plant will be in production mode. When demand and prices are low, the hydro plant will be in pump mode, pumping and storing water in the upper reservoir for later use. The net effect will be to use the stored hydro capacity to balance the intermittent nature of wind power through the optimal use of energy at different times of the day. Fig. 5: The combined wind PWS system (GE). The wind farm, will feature the tallest turbines in the world at 246,5 m. The wind turbine generators will sit at a hub height of 178 m, while the lower 40 m of each tower and its surrounding area will be utilised as active water reservoirs to store energy. At its full capacity, it would produce 13, 6 MW, along with another 16 MW from the hydroelectric plant. The proposed plant layout is shown in Fig. 4. The turbines are scheduled to be commissioned by the end of 2017 and the full Gaildorf power plant is expected to be operational by the end of 2018. Whether the pilot project will be commercially viable remains to be seen. German pumped storage plants are struggling to operate profitably and prices in the balancing market are falling as more players enter the market . Off grid wind and solar systems rely mainly on battery storage to provide a usable reliable supply of electricity over the full day’s usage. The use of micro PWS systems for regulating domestic power for small off grid applications has been proposed in a paper by using a PWS with head of 15 m and separate pump and turbines, coupled with solar and wind generators, the system is capable of providing both long term and short term energy storage . The study showed that a net financial benefit resulted from altering the solar and wind power system into a solar-wind pump-storage power system . European commission: “Amari Hybrid Energy Project at Crete”, Investment Project EIPP-20160049. Renewable Energy World: “Montana Pumped Storage Hydro Facility to Augment Regional Wind Power Generation”, 28 December 2016. Sulzer: “Pumped hydro storage power”, www.sulzer.com/fr/-/media/Documents/Cross_Division/Industries/Power_Generation/Brochures/PumpedHydroStoragePower_E10125.pdf. M Coren: “Germany is building the world’s first wind turbines with built-in hydroelectric batteries”, Quartz media, 1 Nov 2016. S Kasu: “Small Scale Solar-Photovoltaic and Wind Pump-Storage Hydroelectric System for Remote Residential Applications”, International Journal of Electrical, Computer, Energetic, Electronic and Communication Engineering, 2015. A Blakers: “100% renewable electricity in Australia”, Australian national university, February 2017.